The SPOR Evidence Alliance specializes in knowledge synthesis, clinical practice guideline development, patient-oriented research, and knowledge translation. 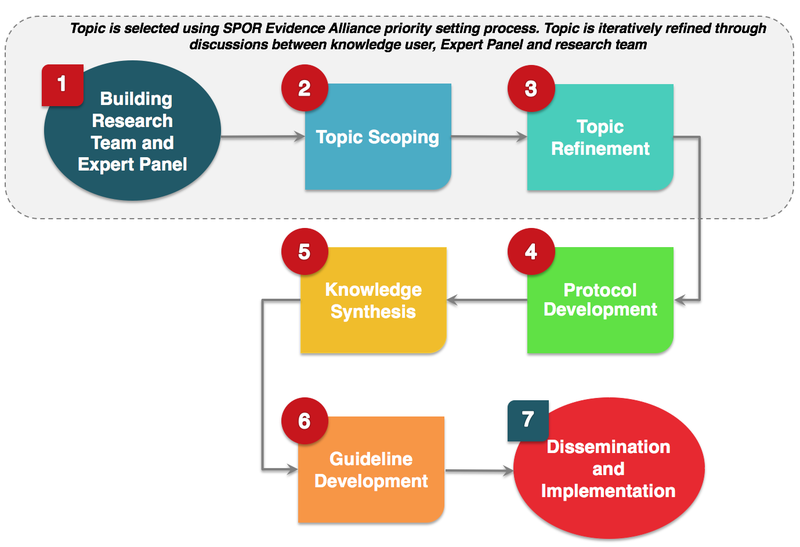 Using an integrated knowledge translation approach, the SPOR Evidence Alliance will answer health-related research queries for policy makers, clinicians, patients, and other individuals/ organizations who request scientific evidence to inform their decisions. Our wide network of experts in our core research methods will also work together to carry out methods studies to advance the science of knowledge synthesis, clinical practice guideline development, patient-oriented research, and knowledge translation. The SPOR Evidence Alliance also offers training and mentorship opportunities in the four core research methods to new researchers, research staff, and stakeholders in research. A knowledge synthesis systematically summarizes all important studies on a specific research question to help make sense of the varying evidence on the topic. It allows health policy and practice decisions to be made based on all available scientific information, rather than a single study or expert opinion, which can be misleading. We use an integrated knowledge translation approach for all knowledge syntheses 1. We engage key knowledge users (i.e., individuals or organizations likely to use research findings to make informed decisions about health systems and practices) throughout the entire research process. Engagement of knowledge users in the research project is planned based on the project timelines, available funds, and their interest and availability. Whenever possible, patients and research trainees/ graduate students are included in the project team. Click on each of the steps in the figure below for more information. Research question is matched to an appropriate knowledge synthesis method in line with the purpose and objective of the research. A team to conduct the research is then set up including members with expertise in the knowledge synthesis method selected, clinical experts, knowledge users, and whenever possible, patients and research trainees/ graduate students. Research question is further refined and developed by clarifying the key elements (e.g., population(s), intervention(s), comparator(s) and outcomes) used to develop the research question. All outcomes that are of importance to our knowledge users are ranked and prioritized by patients and knowledge users using an online group ranking technique. 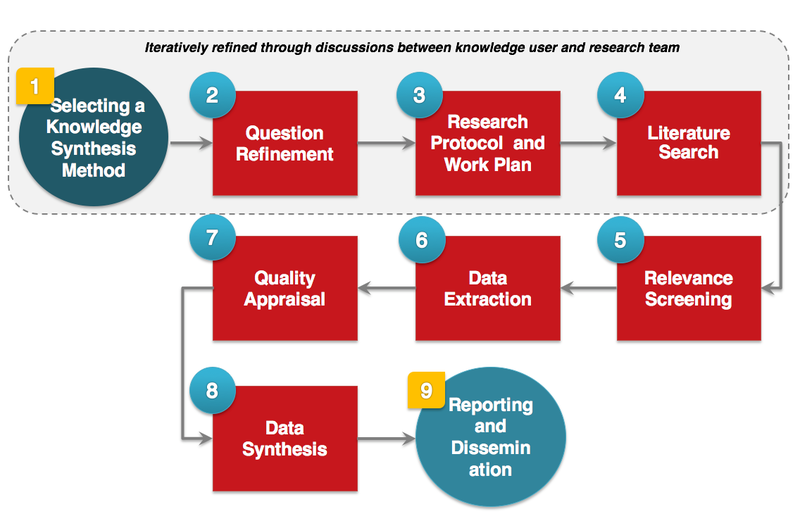 Researchers and knowledge users work together to refine the question(s), as needed. A protocol for the planned knowledge synthesis is developed in consultation with all knowledge users and stakeholders. The protocol follows the reporting guideline, PRISMA-P2, and is peer-reviewed and registered with either PROSPERO or Open Science Framework. A summary of the registered protocol is also published under Our Projects. A work plan outlining the protocol, knowledge user engagement strategy, budget, and timeline is prepared. The work plan must be approved by the knowledge user before starting the review. Multiple electronic libraries (e.g., MEDLINE, EMBASE) including those with specialized clinical areas (e.g., PsycINFO for mental health) are searched. An experienced librarian develops the search terms, which are peer-reviewed by another librarian using the Peer-Review of Electronic Search Strategies (PRESS)3. Grey literature are also considered. A two-level screening process is used beginning with the screening of titles and abstracts of all records from the literature search. Potentially relevant full-texts articles are then screened for relevance. Each phase of screening begins with a pilot-test to make sure reviewers have sufficient agreement (>75%). Each title and abstract and full-text article is reviewed by two independent reviewers and any disagreements are resolved by discussion. Authors of primary studies are contacted when eligibility is unclear. A standardized form for data collection is developed and pilot-tested for agreement (>75%) between reviewers. Data from each article is collected by two independent reviewers. Disagreements between reviewers are resolved by discussion. If a study is missing important information, authors of primary studies are contacted. When applicable, each study is assessed for risk of bias using appropriate appraisal tool by two independent reviewers. This step also begins with a pilot-test to establish agreement between reviewers and any conflicts are resolved by discussion. Both qualitative and quantitative analyses are considered depending on the knowledge synthesis method and the types of evidence included. Appropriate reporting guidelines available on the EQUATOR Network website for the specific knowledge synthesis is used to prepare the final report. Manuscripts are published in a peer-reviewed journal. If the journal is not open-access, a pre-publication version of the manuscript is posted on Our Projects tab. A 1-page research brief is prepared to provide a high-level summary of the research findings. A clinical practice guideline is an evidence-based or consensus-based statement prepared to help improve the quality and consistency of care for specific clinical conditions or situations. They incorporate the most current clinical information based on all available scientific evidence and professional opinions into a framework of best practices to promote the best patient outcomes. Our goal is to support the development of more patient-centered and end-user-friendly clinical practice guidelines using an integrated knowledge translation approach. Research teams will include patients throughout the process when possible, or at various stages of guideline development. One a clinical practice guideline is approved using the SPOR Evidence Alliance priority setting process, a research team is set up. The primary research team consists of methods experts and experienced research staff in knowledge synthesis, guideline development and knowledge translation. Knowledge users are consulted to appoint an Expert Panel consisting of 10-15 multidisciplinary members, including patients (if possible) and healthcare providers. Chairs of the Expert Panel are nominated based on their objectiveness, responsiveness, and ability to facilitate group decisions. None of the research teams or Expert Panels can have any potential/perceived conflicts of interest. Training on disclosure of conflicts of interest, group participation, and expectations is provided to panel members. The research team prepares a clinical practice guideline protocol with details on the research questions, objectives, and methods. The Expert Panel reviews the protocol, and the revised version is sent for review by the knowledge users, any relevant Canadian guideline developers, patients, and stakeholders. The protocol is then sent for external peer-review and is revised accordingly. The final protocol is registered with a registry database, submitted for peer-reviewed publication, and then the published (or per-published) version is posted in Our Projects tab. The Expert Panel prepares a draft of the guideline recommendations using the GRADE guidance and votes on the recommendations during a face-to-face meeting. The research team prepares the guideline report based on the recommendations. The recommendations are sent for external peer-review and submitted for publication in a peer-reviewed journal. The final publication is posted in Our Projects tab. The research team creates user-friendly resources to support dissemination and implementation of recommendations. Patient-oriented research engages patients as partners in research, and focuses on patient-identified priorities to directly improve patient outcomes. It is conducted by multidisciplinary teams in partnership with relevant knowledge users and stakeholders and aims to ethically apply the evidence to improve healthcare systems and practices. We follow a robust and inclusive approach using the SPOR Patient Engagement Framework that involves patients in all aspects of research, from prioritization of research queries to distribution and application of research findings. Patients will be included in all of the SPOR Evidence Alliance’s core research activities, leadership, and governance. We will use an evidence-based approach when developing our patient engagement strategy to accommodate any known barriers and facilitators to participation and ongoing commitment. Knowledge translation is the process of summarizing, distributing, sharing, and applying the knowledge uncovered by researchers to improve the health of Canadians, and strengthen the health care system through the use of services and interventions proven to be more effective. Our philosophy is to use theory and evidence to guide our knowledge translation approach. We will publish all knowledge products, such as patient-friendly infographics, research briefs, and brochures on this website. Published manuscripts that are not open-access will have the pre-publication versions of the papers posted under the Our Projects tab on this page. For all clinical practice guidelines, an integrated knowledge translation approach is used. This involves engagement with all knowledge users and stakeholders to identify the needs and preferences of the end-users by assessing the barriers and facilitators to uptake of the recommendations. Barriers and facilitators will be identified through qualitative interviews or focus groups of relevant patients and other relevant knowledge users after the completion of each clinical practice guideline. We also use current best evidence to design our strategy for clinical practice guideline adoption. To identify evidence-informed knowledge translation strategies, we conduct grey literature searches using established databases. Gagnon ML. Moving knowledge to action through dissemination and exchange. Journal of clinical epidemiology. 2011;64(1):25-31. Shamseer L, Moher D, Clarke M, et al. Preferred reporting items for systematic review and meta-analysis protocols (PRISMA-P) 2015: elaboration and explanation. BMJ (Clinical research ed). 2015;349:g7647-g7647. McGowan J, Sampson M, Salzwedel DM, Cogo E, Foerster V, Lefebvre C. PRESS Peer Review of Electronic Search Strategies: 2015 Guideline Statement. Journal of Clinical Epidemiology. 2016;75:40-46. The SPOR Evidence Alliance is supported by the Canadian Institutes of Health Research (CIHR) under Canada’s Strategy for Patient-Oriented Research (SPOR) Initiative. Copyright © 2019 SPOR Evidence Alliance.